If you want to understand the state of mind of the typical journalist today, or to dig into the challenges they face in managing their careers, you don’t have to look far—as long as you mean the typical newspaper journalist. Although there is plenty of online debate and discussion of journalistic issues, the mass of it concerns the daily press. To learn about how these issues affect the typical magazine journalist, you have to look harder. And if your interest is in trade journalists, well, good luck: they are the profession’s obscurest members. That’s what makes a recent Twitter chat among B2B editors and writers a valuable resource. Sponsored by the ethics committee of ASBPE, an association for trade press editors and writers, the chat showcased the issues that particularly worry them. Preventing undue influence by advertisers (given the nature of B2B publishing, this topic was front and center). Dealing with insufficient staffing and hiring. Finding the proper level of involvement with marketing (particularly in sponsored webinars, a medium uniquely popular in trade publishing). Managing freelancers, particularly with respect to expectations regarding plagiarism and attribution. 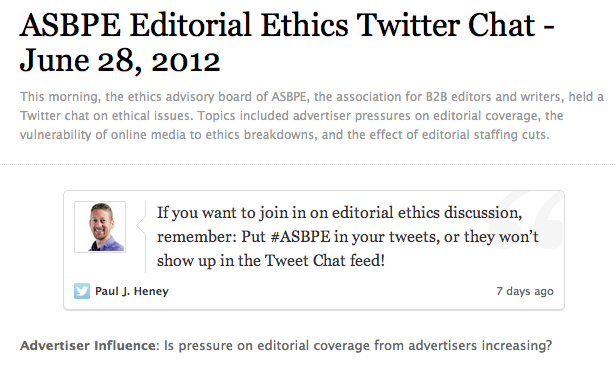 Effectively using ethics guidelines like ASBPE’s Guide to Preferred Editorial Practices. Understanding the proper relationship between professional and personal use of social media. These concerns are not unique to B2B journalists, of course. But the way they play out in the trade-press arena is in some ways very different from the rest of journalism. This twitter chat only gives a hint of that important difference—but it’s a start. Do B2B Editors Get Twitter? This entry was posted in Journalism and tagged B2B editors, B2B publishing, editorial, Ethics, journalism, Social Media, trade press, Twitter by John Bethune. Bookmark the permalink.